They have worked with artists and ensembles including Quartetto Gelato, Payadora Tango Ensemble, Jill Barber, Esmeralda Enrique Spanish Dance Company, The Hogtown Syncopators, The Gryphon Trio and The Art of Time Ensemble. The Venuti String Quartet can be heard frequently as recording artists for film and various recording projects including Royal Wood's, Donovan Wood's and Justin Gray's most recent records. Upcoming shows for the quartet include performances in Massey Hall, Aeolian Hall, National Arts Centre, the Harbourfront Centre, the Toronto Music Garden Summer Concert Series and the Indian River Music Festival in Prince Edward Island. Celebrated for her stunning virtuosity, nuance and broad musical versatility, Wisconsin-born violinist, Rebekah Wolkstein has established a strong presence on the Toronto music scene. As a classical violinist, Rebekah has performed and toured extensively with the Toronto Symphony Orchestra, The National Ballet of Canada, The Canadian Opera Company, and in recitals with famous baritone, Russell Braun. An active studio musician, Rebekah is also at home playing folk, klezmer, pop, latin, and jazz and can be heard on numerous recordings. Aside from her active performing career, Rebekah holds a doctorate in violin performance from the University of Toronto as well as degrees in violin from the Cleveland Institute of Music. Rebekah is a member of the Payadora Tango Ensemble which has performed sold-out shows at the St Lawrence Centre for the Arts, Four Series Centre World Music Series and Toronto Music Festival. As a member of Payadora, Rebekah has been featured with the London Symphonia and Hannaford Street Silver Band. This summer, Payadora is performing at the Ottawa Chamberfest. Rebekah performs regularly on the Westwood Concert Series. She has performed solo violin performances with Esmerelda Enrique Spanish Dance Company, Kaeja Dance and live to air with Simon Spiro on classical 96.3 FM and in recitals with Russell Braun, baritone. She also enjoys performing on her hardanger fiddle, a beautiful and resonant nine-string Norwegian instrument. Rebekah teaches private lessons, a string ensemble and a tango ensemble at Humber College. Drew Jurecka is in high demand, not only an accomplished jazz and session violinist but also as an arranger, producer, composer and multi-instrumentalist. Trained classically, he studied with Lorand Fenyves and has a degree from the prestigious Cleveland Institute of Music. Drew has spent the last twelve year years playing jazz, pop, rock and other contemporary styles in Toronto. Though violin is his primary instrument, he also works frequently as a performer and recording sideman on viola, saxophone, clarinet and mandolin. An in-demand soloist, session player and sideman, Drew can be heard frequently in clubs and theatres around Canada with his own group or as a part of one of his bands, The Hot Jazz String Quartet and the Hogtown Syncopators. Drew has performed, recorded and arranged for a broad spectrum of artists in many genres, including Royal Wood, Donovan Woods, Justin Rutledge, Buffy St Marie, Banners, Amelia Curran, Classified, David Miles, Russell DeCarle, Jim Cuddy, Bahamas, Sarah Slean, Ron Sexsmith, Chris Whiteley, Jesse Cook, Rita Chiarelli, David Buchbinder, Lynn Miles. For five years, Drew played with Jeff Healey as part of his Jazz Wizards band, which toured extensively across Canada. Drew can be heard on three of Jeff Healey’s CDs, including the Juno Nominated "Last Call". Drew has also toured nationally and internationally with The Polyjesters, Jesse Cook, Stuart McLean and the Vinyl Cafe, Alex Pangman, the Bebop Cowboys and Jill Barber. He is currently a member of Jill Barber’s band, where he plays Violin, Saxophone and Clarinet. He co-wrote five songs on Jill’s recent album “Mischievous Moon”, which spent six weeks as Canada's best selling jazz album after its release in April 2011. Drew took on the role of producer, arranger and orchestrator for Jill’s album “Chansons”, which spent 6 weeks as Canada’s best selling Jazz record after it’s release in 2013. He also co-wrote, arranged and co-produced her latest album “Fool’s Gold”, released in mid 2014. Drew's arrangements have been used on countless records for artists across Canada, the United States and Europe. Drew has written original scores for eight stage plays, including seven for Vancouver-based ‘Monster Theatre’ and one for Tracey Erin Smith’s play “the Burning Bush”, which has been performed extensively in Toronto and New York City. He has also written and produced music for film, including the award winning documentary "Cuba Libre" and the recent shorts "An Insignificant Man” and “Sidestep Goosestep”. 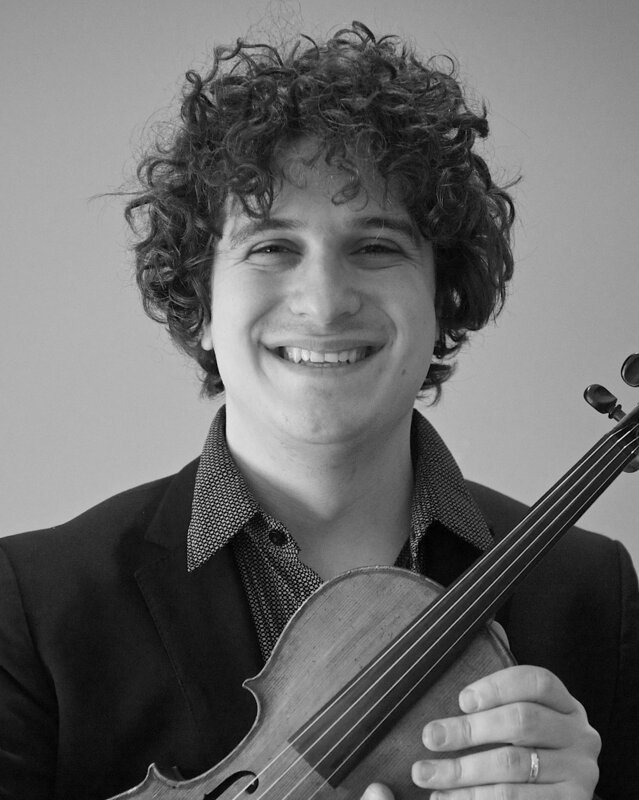 Drew currently teaches violin at Humber College, where he has helped to create the only specialized jazz strings post-secondary program in Canada. In seven years, the program has quadrupled in size and now includes ensembles, technique and master classes in addition to private lessons. His students have gone on to win international jazz awards and to perform and record in Canada, the US and France.From 2002 - 2011, Drew was the director of the Jazz series at the Northern Lights Music Festival in Guadalajara, Mexico. During that time he sold out nearly every show, performing with renowned Canadian artists such as Richard Underhill, Daniel Barnes, Terra Hazelton, Sophia Perlman and Jill Barber. As a child, Drew worked as an actor, including a starring role as Josy, a gypsy violinist in the Sony Classical film “Liszt’s Rhapsody”. Drew also had feature roles in Norman Jewison’s “Language of the Heart” and Robert Wuhl’s feature film “Open Season”. Shannon Knights has distinguished herself as an outstanding performer and teacher, throughout Ontario and Quebec. She has experience in chamber and symphony orchestras throughout both provinces and is a sought after viola teacher in the greater GTA. Shannon has performed with major symphony orchestras including the Toronto Symphony, The Canadian Opera Company and Tafelmusik. She has also toured with several orchestras throughout Europe and Iceland. In addition to Steven Dann, her principal teachers include Andre Roy and Nick Pulos. Shannon completed her Artist Diploma in viola performance from the Glenn Gould School of Music and attended McGill University in the same capacity, before auditioning and becoming a member of the Quebec Symphony. Shannon has also had the opportunity to work with Kim Kashkashian, Roberto Diaz and Robert Vernon. As a viola teacher, Shannon has taught violin and viola privately for over fifteen years and also served as a board member and viola coach with the Durham Youth Orchestra. She currently teaches at the Trafalgar Castle School in Whitby, Ontario. As an enthusiastic chamber musician, Shannon has been a member of several quartets and quintets over the years including her current work with the Venuti String Quartet. As a member of the Cartier Quartet in Quebec City, Shannon also had the opportunity to play with the Penderecki Quartet at Quartet Fest in Waterloo, Ontario. She has also performed on several recordings and in large performance venues, including the Juno awards. Cellist Lydia Munchinsky (nee Helsdon) grew up near Aylmer Ontario where she began her music studies with piano at age 4 and cello when she was 10. She completed her ARCT in performance for both piano and cello before coming to Toronto in 2000 to study cello with Simon Fryer and piano with Peter Longworth at The Glenn Gould School of Music. At the ages of 10 and 12 she performed at the International Suzuki Conventions in Australia and Korea, and spent 3 months as an exchange student in France when she was 16. When she was 19, Lydia traveled across Europe with her cello for 5 month, 3 of which were spent in Switzerland at the International Christian Study and Philosophy Centre l'Abri. Since completing the Performance Diploma Program at The GGS, Lydia's eclectic performance experience has included playing for Stage West and Theatre Aquarius, Dr. Draw, Sarah Slean and the Array Ensemble. She is also a member of the chamber folk group Ozere, which was recently nominated for a Canada Folk Music Award, and has toured extensively throughout North America and Korea with Quartetto Gelato, usually with her baby daughter in tow. Lydia is featured on their most recent recording, All Original, 100% Canadian, as well. She has premiered solo cello and chamber music works by a number of Toronto and Austrian composers and gives recitals regularly, some of which have been recorded by CBC and CIUT radio. Lydia taught for two years with Sistema Toronto in Parkdale and currently teaches at the Toronto School for Strings. She also has 2 beautiful children ages 2 and 4. Want to see the Venuti String Quartet play live? Subscribe to our mailing list here! We won't send you any spam - just news about concerts and recordings!